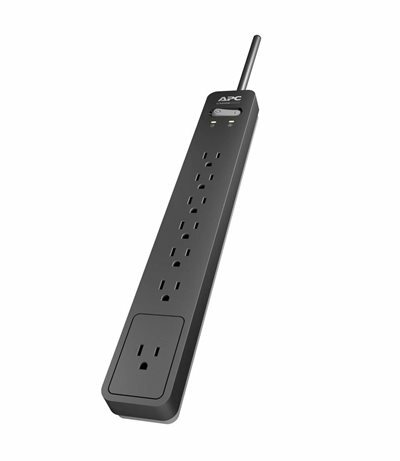 7 surge-protected outlets offer power to several items at the same time and guard connected devices against potentially harmful surges and spikes. The SurgeArrest will warn you if its circuitry has been damaged by a heavy strike or power line surge and it is unable to provide 100 percent protection. If the Protection Working LED is not illuminated, simply contact APC, and we will replace your SurgeArrest free of charge. The PE76 has been tested and approved to work safely by a third-party Nationally Recognized Testing Laboratory (NRTL). The APC PE76 surge protector features a Building Wiring Fault LED to warn you of potentially dangerous wiring problems in the wall circuit. The Protection Working LED illuminates when the SurgeArrest is switched on and supplying protection to your connected equipment. If your SurgeArrest PE76 has been damaged by a heavy lightning strike or power line surge, APC will replace it free of charge.